No one seems to have noticed this in the rush to cover the iPhone, but Steve Jobs seems to have completely blown off Mac users at MacWorld this year. There were no announcements of new Macintosh computers. There were no updates of Mac OS X. No mention of iLife updates. Apple didn’t even announce any cool new applications for Macs. 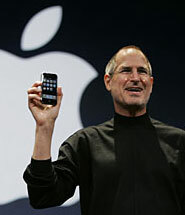 Instead of offering any morsel of goodness for Mac users, Steve Jobs used the stage at MacWorld to announce that Apple was removing the word computer from its name. None of the products that Apple announced at MacWorld are Mac products. The iPhone runs a version of OS X, but can’t really be considered a Mac because it runs a very limited version of the operating system, with a different user interface. The phone also can’t run user apps. The AirPort Extreme is a wireless networking solution, and Apple TV appears to be platform neutral. Based on Jobs’ announcements at MacWorld, it looks like Apple will be introducing fewer Mac-specific product, and will instead be focusing on consumer electronics that they can sell to any computer user.